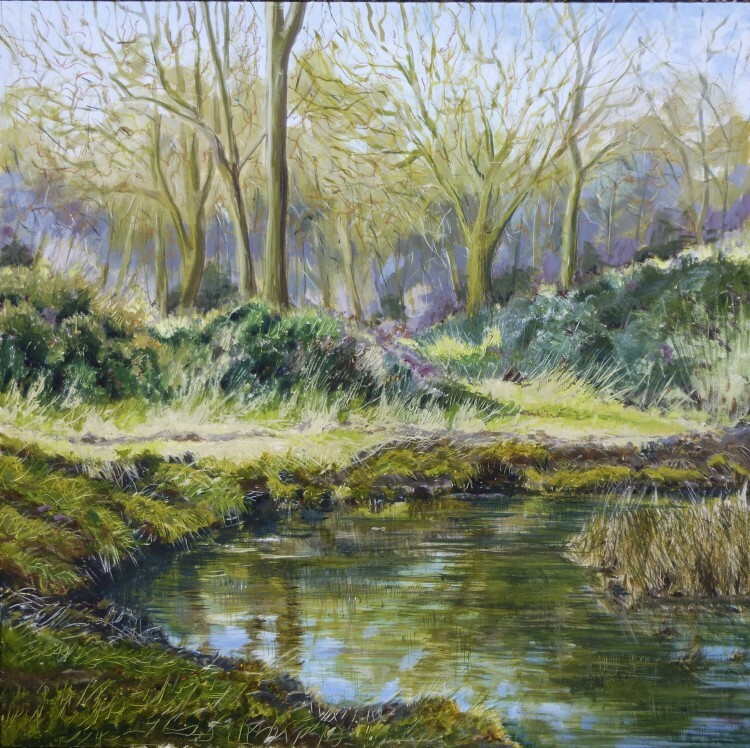 So, here is the third BIG painting in my 2016 Essex Wood project – this is Essex Wood: March, and shows one of the ponds which is not far into the wood, on the right of the main entrance path. I liked the way the old pale dry grass was lining the edges of the path, but some new green grass was growing around the pond, and the deep reflections of the trees in the water. I’ve noticed as I’ve been driving around this last week that the blackthorn blossom is out, and some of the hawthorn is beginning to show a haze of new green leaves, so I think when I make my April visit to the wood there should be quite a big change! For those of you in the Colchester area: I’d like to draw your attention to the fact that tickets for all the evening events at the Lexden Arts Festival are now available on our website – www.lexdenartsfestival.org.uk. Perhaps of particular interest to art lovers, James Russell is coming from Bristol on Wednesday, 4th May, to give a light-hearted informative illustrated lecture entitled ‘Eric Ravilious and Edward Bawden: an Artistic Friendship’. Many of you will know that James Russell curated last year’s ‘Ravilious’ exhibition at the Dulwich Picture Gallery, and wrote the accompanying book. He also wrote the Mainstone Press series, ‘Ravilious in Pictures’, and has a new title out just before the Festival called ‘The Lost Watercolours of Edward Bawden’. Tim Mainstone, who runs the Mainstone Press, is also coming to the evening with a display of Russell’s books (including this new one) which will be available to purchase.